It’s that time again when Piggotts Flags and Branding Ltd gets wrapped up in the silly season nice and early. We actually start thinking about Christmas before even the great adverts start getting thought about, as to plan a scheme for a well-known shopping outlet like Freeport Braintree doesn’t happen overnight. It takes a lot of thought, design, planning and around ten days to install the scheme. 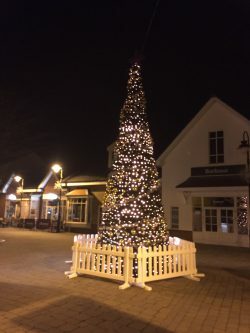 We have been installing the Christmas lights at Freeport Braintree for four years now. If anyone has been to Freeport over the Christmas period, you will know that there are a number of big set pieces that form part of the scheme, but there also many parts that you might not notice as much. In the scheme itself there are over 600 metres of lights. There are actually 12 trees in the scheme, one main 7m tree and one giving tree located in the Shopping Centre itself. There are six trees on the main sign as you come into Freeport Shopping Centre (two x 3 metre, two x 2 metre and two x 1.5 metre trees) and four x 1m LED trees on the main entrance walkway. There are also seven purple bows that you see at the entrances with over 100 metres of LED lights that are fixed into the various decorations, but the most impressive statistic is that there are over 12000 purple, gold and turquoise baubles in the scheme! Most of the decorations have been specially made for the scheme, which is bespoke for Freeport Braintree and the planning of the installation is very meticulous and breaks down each decoration into its own schedule. Each atrium takes a night to install and requires our engineers to be working at height all night. The main tree of the scheme is seven metres tall and comes in four separate sections, all of which have to be assembled on site. The main Freeport Braintree sign also takes a night to install the six festive trees that are sitting proudly on top of it. Not to mention the time it takes to install 58 small Atari Stars and six large ones that are spread out over the shopping centre, the other centrepiece of the glowing rings also takes a night to install. Of course by all this, what I actually mean is with a little help from Santa and his Elves and some Christmas dust, the scheme appears overnight just like everything with Christmas…. it’s all done with magic!